This is a jaw-dropping experience and a must visit for animal lovers and nature enthusiasts. At the Cheetah experience, you get to interact with cheetahs, lions, leopards, wolves and meerkats, caracals and cheetah cubs. You can also join the research group or the volunteering experience if you are having an extended visit. Click the day-to-day lives of these wild cats and explore the wild in mundane! Package tours are available that include lunch and other facilities. Tours for children are conducted at 10.00 am. Adult tours are scheduled at 11.00 am, 12.00 pm, 02.00 pm and 03.00 pm. How popular is Cheetah Experience? People normally club together Oliewenhuis Art Museum and Sa Armour Museum while planning their visit to Cheetah Experience. This is a conservation establishment. Most cats here are rescues. 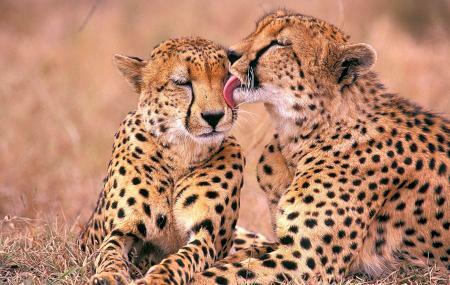 Cheetahs are like domestic cats you can pet. Great for kids and adults. And so close to town. A must visit. You can see that all the animals are well loved and looked after. They are constantly growing the enclosures and put tons of effort into the interaction with and entertaining of the animals.